An excellent English rendition with elaborate design raised upon root feet. 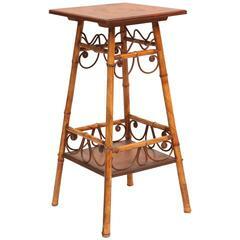 Whimsical style with "curly q's" on each side, oak top and flared legs. 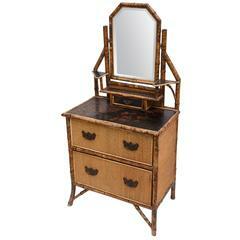 Nice "tailored" design with attached original bevelled mirror - vanity form with drawer below. The case is finished with grass cloth and "capped" with a nicely "Japanned" top. A rare piece signed Ridder, Amsterdam. Inspired by the Dutch colony in Indonesia. Faux bamboo (English, 19th century) ebonized and gilt trimmed round stool/bench with a needlepoint seat. 19th century English oak turned bench with a newly upholstered seat in linen, finished with a single welt decoration. 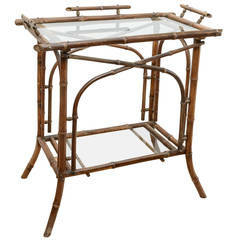 The frame has hand-turned legs and stretchers. Wonderfully scaled 19th century French Louis XIII style walnut bench or footstool with finely turned legs and stretcher. The upholstery accented with brass tacking, circa 1890. 19th century Italian carved walnut bench with Vienna straw, 1890s. The pair of 18th century Italian Baroque style walnut benches with upholstered seats, turned legs and stretchers.